Scrapbooking by Débora Prass: Harry Potter 6!!! Bom, eu tinha que fazer um post, porque AMEI o filme! Achei excelente, captou bem o espírito do livro! E olha que esse nem é meu livro favorito, gosto mais do Prioseiro de Askaban. Quem mais aí já viu??? Agoa vou pra Scraperia, tem uma tarde animada pela frente! Being crazy for HP, I went to see HP and the Half Blood Prince on opening night. It was completly sold out, and even the trailers were great: we got to seetheNew Moon trailer! Well, I had to write about it because I just LOVED the movie! It really captured the spirit of the book. 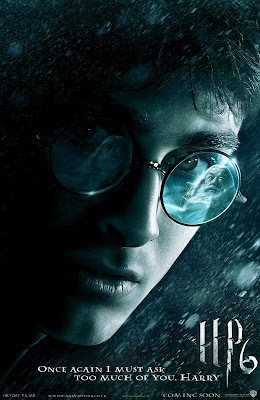 And this isn't my favorite HP book, I prefer the Prisioner of Askaban, but this movie was amazing. Have you seen it? I saw this movie on Wednesday. I loved every minute of it and want to see it again. I can't read what you wrote but I hope you get to see it soon! I know that many people have said there are some differences from the book...but when does a movie follow a book PERFECTLY? I love the books and I love the movies just in different ways. Novas páginas, e scrap by Bia! Primeiras fotos da família em Curutiba!